All these searches share the goal of narrowing constraints on possible theories of dark energy by narrowing the allowable values of w, the dark energy "equation of state," the ratio between its pressure and energy density. At the Supernova Workshop Isobel Hook reported, by conference call from England, on a recent report from the Supernova Cosmology Project. After performing several comparisons of high-z and low-z supernovae in a group of 14 Type Ia's, the authors concluded that there are no significant differences among them  or, stated more conservatively, that "there is a sample of high-z Ia's whose properties match those of low-z Ia's." Adam Riess of the Space Telescope Science Institute described the Hubble Space Telescope program named PANS (which stands for Probing Acceleration Now with Supernovae). This search for "higher-z" supernovae seeks the most distant of them all  those from a time when the expansion of the young universe was still slowing, its matter so densely packed that mutual gravitational attraction was strong enough to overcome the negative pressure of dark energy. "This is a pencil-beam search aimed at populating the high end of the Hubble diagram, where we are seeing the deceleration that preceded acceleration," Riess said. PANS "piggybacks on galaxy searches" by the Hubble and has found supernovae of all types, including a handful of Type Ia's in older, elliptical galaxies where they are commonly found, plus others where the host galaxies are very faint or undetectable. One goal is to determine a "reddening law" for estimating changes in various bands of a high-z supernova's spectrum as a function of its redshift alone. Because the light from very high-z supernovae is shifted well into the infrared, the ultraviolet end of the spectrum is hard to detect. Nevertheless, Riess said, the aim is "to match high-z light curves and colors to low-z, particularly in the U band, which is supposed to be the most chemically sensitive, where we should see differences due to metallicity"  a lack of heavier elements presumably due to the home galaxy's youth. "We haven't yet." Kevin Krisciunas of Notre Dame University described ESSENCE (an acronym for Equation of State: SupErNovae trace Cosmic Expansion), a search for 200 distant Type Ia supernova combining a ground-based telescope  to minimize systematic errors, a single telescope at the Cerro Tololo Observatory in Chile is used  with detailed follow-up studies using the Hubble Space Telescope. A major early finding, one that Krisciunas characterized as an "unresolved mystery," was that in a group of nine distant Type Ia supernovae  out of 76 found so far  all but one had more "stretch" in their light curves than is typical of nearby Type Ia's. ("Stretch" refers to a method for calibrating brightness by fitting the widths of light curves to a template.) The observers attributed the difference not to a physical cause but to selection bias, a warning to other high-z searches to guard against such possible skewing of their samples. 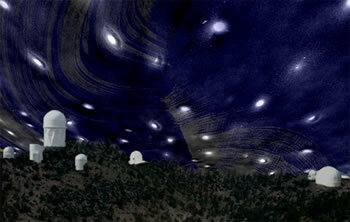 "I'm uncomfortable using these supernovae for cosmology, because they don't look like nearby supernovae," said Riess, a member of the ESSENCE collaboration, remarking that the unusually slow-declining light curves in this set were likely a function of "observation constraints" like telescope aperture, time, weather, and other factors, and were a good example of why "it's hard to do cosmology from the ground." Mark Sullivan of the University of Toronto discussed the Supernova Legacy Survey (SNLS), a purely ground-based search that is part of the larger Canada-France-Hawaii Telescope Legacy Survey sampling the universe at various depths. SNLS intends to find and measure a thousand distant Type Ia supernovae to yield what Sullivan calls "the definitive high-z dataset." More than 70 percent of the Type Ia's the SNLS has found so far were preselected on the basis of photometry alone (their brightness as measured through different filters), then confirmed spectroscopically. But as with all distant supernova searches, spectroscopic confirmation can be challenging. Extreme redshifting means very distant Type Ia's do not even show up in some color bands, and elemental lines important to classification may be hard to identify. A common astronomical filter system is UBVRI, which stands for ultraviolet, blue, "visible," red, and infrared wavelengths. 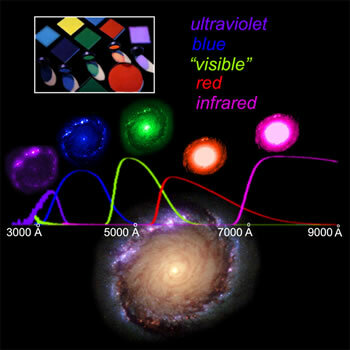 (Unlike their representation in this diagram, ultraviolet and infrared wavelengths are not visible to the unaided eye.) Images taken through different filters may convey different information about the same object. One complication is the different filter systems used to divide up the spectrum. A traditional astronomical system is UBVRI  the letters stand for ultraviolet, blue, "visible," red, and infrared  which uses the star Vega as a baseline for measurements of magnitude. SNLS and the Sloan Digital Sky Survey, among others, use the u'g'r'i'z system  ultraviolet, green, red, near infrared, and infrared  with a more complex way of establishing reference magnitudes (Berkeley Lab's Brian Lee calls u'g'r'i'z the "choice of physicists and bane of astronomers"). Converting observations from one system to another is not always straightforward. Challenges like these led Riess to remark, "As a community, we can't classify all the Type Ia's we think we've found until we can agree on the criteria." As the organizers of the Supernova Workshop intended, the presentations sparked lively conversations about the issues confronting the supernova community. Calibration  how to compare observations made by different teams using different methods on different telescopes  was a continuing theme. Even more urgent was access to data. "All supernova spectra should be posted," said one participant, and another complained that "there are private stashes of spectra floating around." "Would anyone here object to making their spectra available?" Riess asked, more than once. Peter Nugent pointed out that the Supernova Cosmology Project already does so. But in many cases researchers are understandably reluctant to publish spectra before they have been adequately analyzed. "One thing that keeps data unpublished is that we want it to be perfect," Riess said. "A solution to this might be on-the-fly recalibration." "True" spectra and brightness are on the right in this diagram; observed spectra and brightness are on the left. Two similar supernovae can appear dim because of distance alone (top) or because of intervening dust as well (bottom). 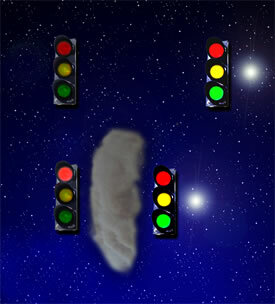 Often they can be distinguished, because dust absorbs red light less than other colors. Saul Perlmutter followed up this suggestion by floating the idea of "version numbers." A supernova description would be registered to the discoverer, and others using the data would cite its version number; the discoverer could update to a newer version at any time. Which differences among Type Ia supernovae are real, which are important, which have to do with the intrinsic physics of the exploding star, which are due to extrinsic factors like "extinction," and which others are mere accidents of measurement? These are some of the questions to be decided. Most basic, said Alex Kim, "is the question of separating a supernova's intrinsic color from reddening by dust in the host galaxy or intervening space. Is color a second parameter?" The question of variation came up in many guises, sometimes as "parameters," sometimes as "dimensions," often as "observables." How can these differences be accounted for, or reconciled, or when necessary, ignored or discarded? Kim says that "for cosmological purposes, some variations may be important, others may not matter. The bottom line is, we'd like to get the supernova community to say, 'These are the fundamental things we need to measure.'" Or is it a cosmological constant?